Having the right diet for diabetics is a must these days. Around the world, 371 million people suffer from diabetes, which accounts for over $400 billion in healthcare costs. And that number is expected to balloon to 552 million people with diabetes by the year 2030. WHOA! That’s over half a billion people. Choosing the right kind of food helps you maintain balanced blood sugar levels if you have type 2 diabetes. And much of the literature also points to diet as one of the leading factors for developing type 2 diabetes in the first place. In my over 10 years working in this area, it is more obvious than ever now that a healthy diet for diabetics is critical. And to bring it back to basics all this really consists of are meals high in nutrients, which are lower in calories and also low in bad fats (saturated fats). 1) Eat food only when you are hungry. Try having 5 small meals instead of 3 large meals. This will help better with your metabolism and will help in reducing blood sugar levels. Also stop eating until you’re full. My mom was from the south and as a kid she would get upset with me whenever I didn’t clean the plate at mealtime. So trust me I’m not pointing any fingers here. 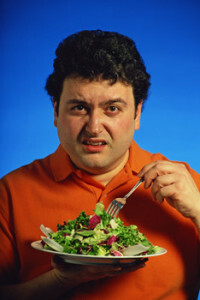 But it certainly isn’t the healthiest to clean the plate, especially if your portion size is too large to begin with. 2) Focus on choosing foods that are high fiber carbohydrates. High fiber carbs release sugar into your bloodstream more slowly and help you to keep your blood sugar levels balanced. These are metabolized more slowly so the insulin production is reduced. They also provide you with energy that lasts for hours and don’t make you feel hungry as fast. Avoid sugar cereals and white rice or white bread. 3) Include foods in your diet that have a lower glycemic index. The GI determines how quickly food is converted into sugar within our body. It is said that high glycemic index foods increase blood sugar more, while low glycemic index foods do it to a lesser degree. You should include foods that have a low glycemic index and are high in fiber in your diet. Such foods may be nuts, seafood, lean meats, and beans. I don’t consider the glycemic index to be the end-all-be-all. I also think the glycemic load of foods comes into play as well as well as other things. I’ll save my opinions for another time. Ultimately, your blood glucose meter is your guide. But the GI is a good gauge. Also, add healthful grains, and unprocessed foods such as brown rice as I mentioned before. Limit sweets as much as you can. Once in a blue moon sweets are Okay though. Include more lean meat such as chicken, turkey, fish and fish such. Try to take off the skin. If you can’t live without the skin, try maybe one day on, one day taking it off until you can graduate to no skin. 4) Reduce the amount of soft drinks and soda you drink. They are high calories and also high in sugar which will cause spikes in your blood sugar levels. Also, avoid having sugar with your coffee or tea. Try Stevia instead. I haven’t found anything bad on Stevia out there and I’ve searched the literature high and low. So try to make it your sweetener of choice. I put it in everything. And it has been found to have some health benefits, including LOWERING blood sugar. 5) Avoid fatty foods. Choose only unsaturated fats. These are considered good fats. These come in the form of vegetable oils such as olive oil and canola oil, and even nuts are considered a healthy fat. You can also include foods which contain omega 3 fatty acids. Omega-3’s contain anti-inflammatory properties as well as many other health benefits, including improving heart health. Omega-3 fatty acids are awesome! I take omega-3 fatty acids every morning with my other vitamins. Foods high in omega-3 include cold water oily fish such as salmon, and mackerel. So I really hope this helped you. It may even sound a little elementary but it isn’t any more complicated than this. The foundation of any diet for diabetics all comes down to these 5 tips. Apart from following this diet, regular exercise is also very important. But if you did nothing else but worked on your diet, you’d be ahead of the game when it comes to type 2 diabetes.